Flower Bomb – this is the new name for our most popular recycled bombshell category. I recently came across this phrase in a magazine, and it just seems to be the perfect description for Oz Fair Trade’s recycled bombshell products. Flower represents life, and these products represent the incredible resilience of Lao and Cambodian people who suffered decades of war and are still suffering from the landmines. Subconsciously, when I took photos of the recycled bombshell products for the website quite a while ago, I took them with flowers from my garden. Do you like the new name? Australia is a lucky country compared to Laos and Cambodia, where millions of undetonated bombs threaten lives every day. During the Vietnam War, the United States dropped more than 270 million sub-munitions in an attempt to block the flow of North Vietnamese arms and troops through Laos. This makes Laos the most heavily bombed nation per capita in the world. It is estimated that more than 30% of these sub-munitions failed to explode, leaving Laos with 80 million of undetonated bombs. Since 1973, there have been around 12,000 explosion-related accidents. 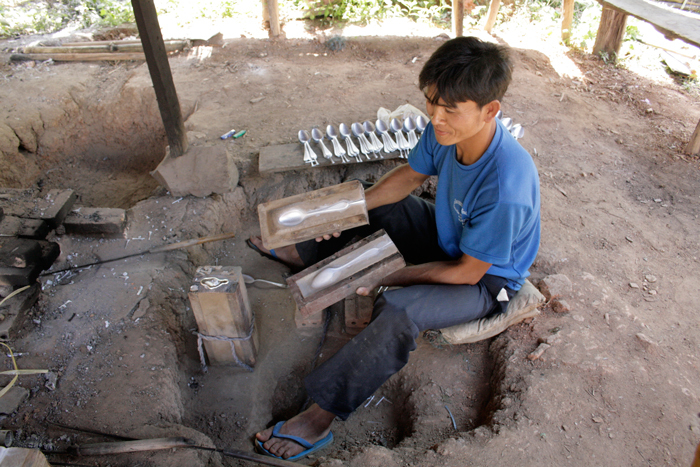 Cambodia’s notorious landmine problem is the product of a civil war that spanned three decades and claimed the lives of up to three million people, or one third of the entire population. Today, more than 40,000 people are amputees. The vast majority of the victims are men and thus the traditional bread earner. It is very expensive to clear lands affected by undetonated bombs. Despite the efforts of the relevant government bodies in both countries, millions of undetonated bombs are still unremoved. It is within this context that a new type of product was born: recycled bombshell. Aluminium and brass are commonly used in the construction of bombs. 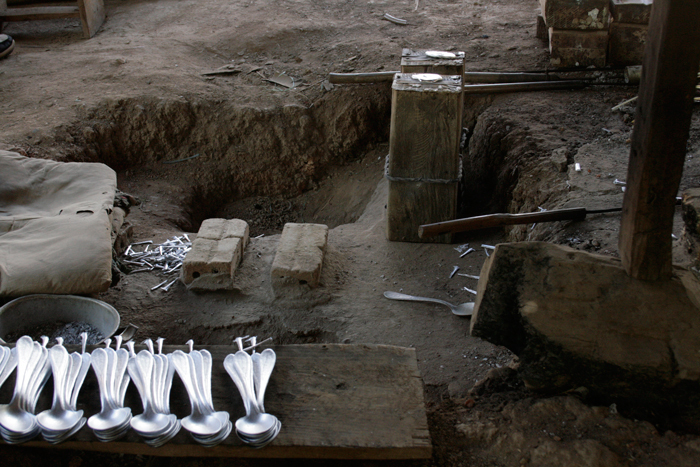 Once exploded, the metals can be melted and made into spoons, chop sticks and jewellery. The local people started with making spoons out of bombshells to feed their children after the war. With the help of western designers and innovative thinkers, they started to turn bombshells into beautiful jewellery. You can view how bombshells are turned into jewellery from our Oz Fair Trade’s YouTube channel. 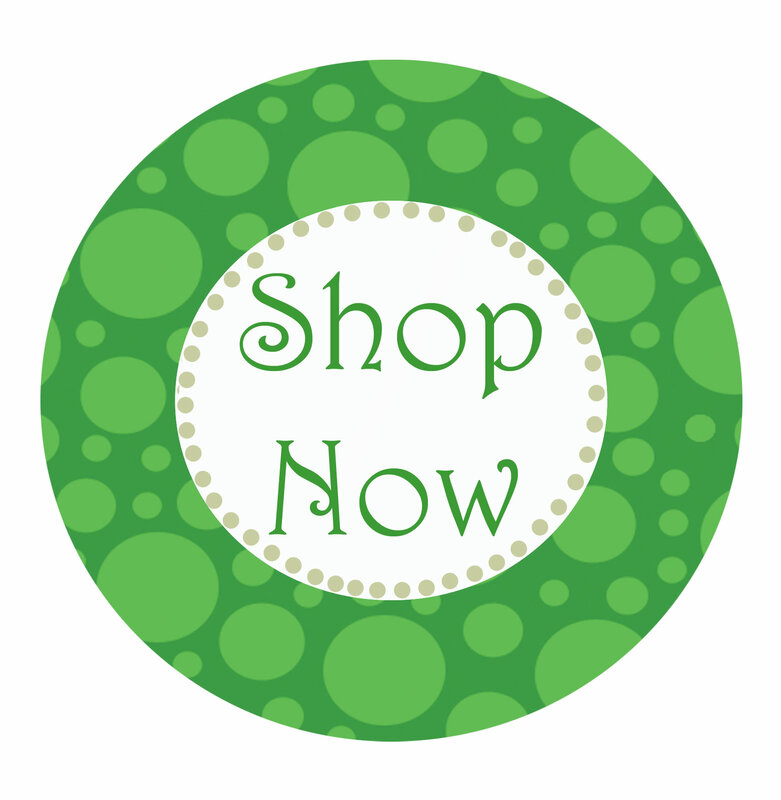 It is estimated that it will take 800 years to eliminate all the undetonated bombs in Laos and Cambodia, but buying these recycled bombshell products can help hasten the process: each purchase supports landmine removal from 5 square meters of land. The farmer-artisans who make the products from wartime scrap metal earn a living for their families while bringing income and investment into their communities. Q: How did people learn to melt the bomb metals? A: There is a mysterious story about a man melting metals after the war and made spoons from them. A few men watched him, and the skill was passed from one family to another, from one generation to the next. Q: Is collecting bomb scraps dangerous? A: Each country has its own dedicated organisation that carries out skilled land clearings. The people there are well trained and experienced. Generating an income from recycled bombshell products help them to train more people to clear lands affected by undetonated bombs. These people have a very positive attitude: the bombs are here so we might as well do something productive with them. Q: What is the process from bomb to jewellery/spoon? 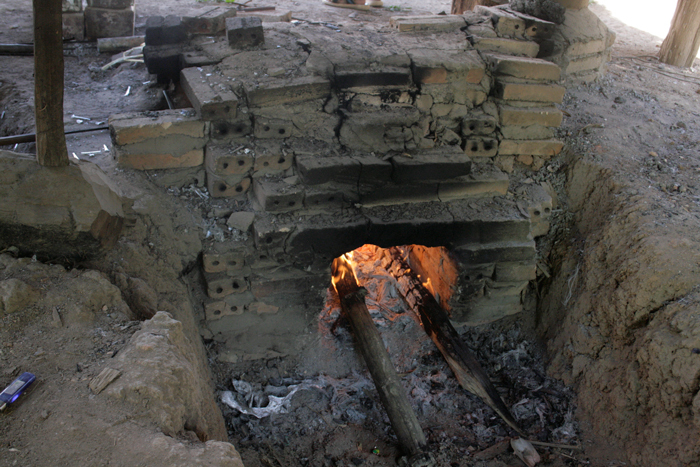 A: The artisans use handmade molds, which are made of wood and ash from the fire. They make a square wood box and fill that box with ash or dirt, which is mixed with water. They make the shape – an impression on both sides of the mold – and let it dry to a plaster. When it’s all dry, they pour the metal that they’ve melted from disabled mines in their kiln into a little hole, shaping out the piece. 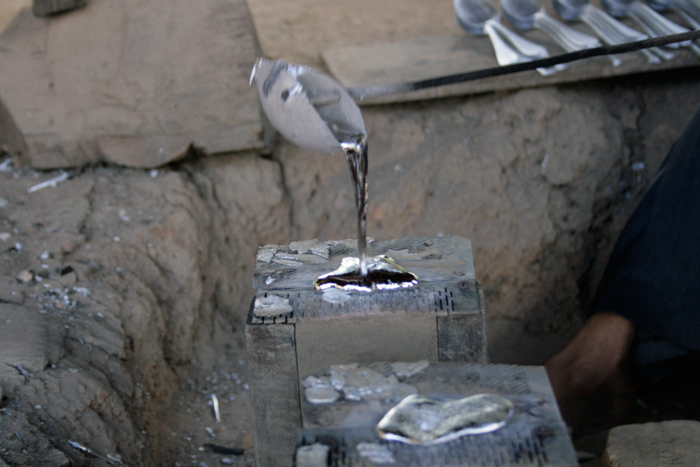 Once it’s cooled, they sand it smooth – into a unique piece of jewellery/spoon. Spread a message of peace.